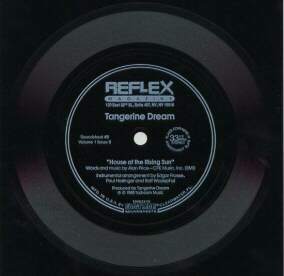 The US Reflex Magazine Volume 1, Issue 9, from March 1989 was issued with a 7" flexi disk. Only side one of the disk contains music, side two is blank. It features the traditional House Of The Rising Sun (famous from the 1964 interpretation by The Animals) that was arranged and played as an encore by Tangerine Dream during their 1988 US tour. Additionally the magazine featured a six page article on TD, titled "Electronic Sorcerers: Tangerine Dream" by Rich Shupe. With Antique Dreams in 2000, twelve years after its recording, this track has been released for the first time on a regular TD album.